Portsmouth, New Hampshire (August 23, 2014) – Thanks to legislation passed in 2010, the state of New Hampshire commemorates Portsmouth Peace Treaty Day – the day the treaty ending the Russo-Japanese War was signed at the Portsmouth Naval Shipyard – on September 5 and in perpetuity. By creating Portsmouth Peace Treaty Day the State Legislature made New Hampshire the only state in the nation to honor its citizens for the active role they played in fostering successful international negotiations. 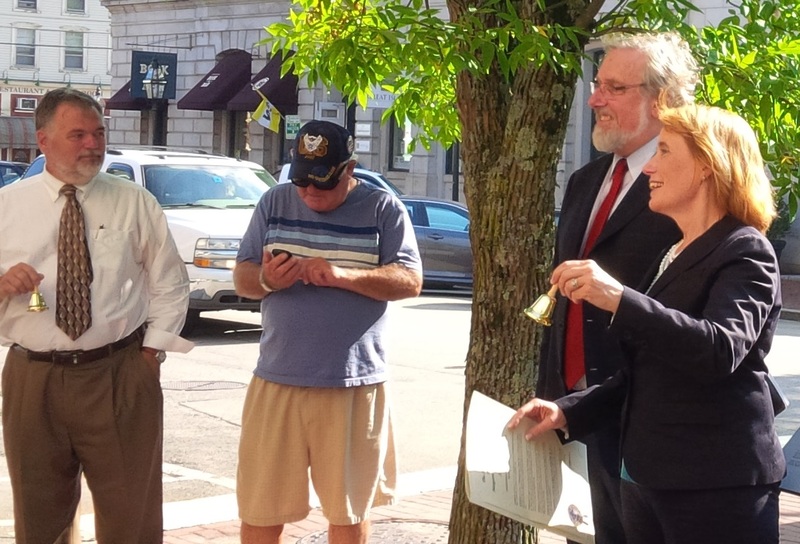 Portsmouth celebrates Portsmouth Peace Treaty Day on September 5, 2014 with the annual bell-ringing at 3:47 pm– the moment the Treaty was signed in 1905 – and with Governor Maggie Hassan reading the Governor’s Proclamation. Portsmouth Mayor Robert Lister, Japanese Consul-General Tsutomu Himeno and Portsmouth Peace Treaty Forum chairman Charles B. Doleac are also attending. The ceremony takes place at the City of Portsmouth Historic Marker on Pleasant Street opposite North Church in the middle of downtown Portsmouth. The Historic Marker installed last year on Portsmouth Peace Treaty Day and the Judge Calvin Page Portsmouth Peace Treaty memorial on the wall nearby emphasize the role local citizens played, along with NH Governor John McLane, as the official hosts for the peace conference. Bells ring in other locations around the state, especially where cherry trees are planted as a living memorial to the Treaty. These sites include Wentworth By the Sea, Strawbery Banke Museum, the John Paul Jones House Museum and the public schools of Portsmouth. Temple Israel (200 State Street) will blow the shofar, the traditional ram’s horn. Portsmouth Public Schools will ring bells and the Sister City of Nichinan, Japan will do the same. Free maps for the self-guided walking tour of the Portsmouth Peace Treaty Trail that links iconic sites of the Treaty summer, are also available at the John Paul Jones Museum, at the Discover Portsmouth Center and at the Greater Portsmouth Chamber of Commerce information centers on Market Street and in Market Square. The commemoration of the Portsmouth Peace Treaty is supported by the Portsmouth Peace Treaty Forum through the Japan-America Society of NH. To learn more about the Treaty, scheduling an exhibit, NH Humanities Council lecture or other programs, visit www.PortsmouthPeaceTreaty.com or contact Charles Doleac, cdoleac@nhlawfirm.com, 603-436-4010. For a month's view Calendar, click here. For information about ordering fine art prints of this Treaty Centennial symbol, and other commemorative items, click here. To join the Japan-America Society of New Hampshire online, click here. For a Russian-language description of the Treaty exhibit click here. For the Russian-language Library of Congress description of the Treaty of Portsmouth, click here. Treaty of Portsmouth 1905-2005 book of reproduction historical postcards. For hours, directions, details on the Portsmouth Historical Society museum where the Portsmouth Peace Treaty exhibit is displayed, click here. For hours, directions, details on Strawbery Banke Museum and the Shapiro House, owned by one of the founders of Temple Israel who figured in the Treaty citizen diplomacy, click here. For information about Portsmouth Naval Shipyard and Building 86 where the formal negotiations were held. click here. For more information about Wentworth By the Sea Hotel, where both delegations stayed, click here. For more information about Green Acre Bahai School and Sarah Farmer's commitment to the peace process, click here. The Portsmouth Public Library maintains an micorfilm archive of local newspapers and an index of the relevant Treaty reporting and other related materials. The archive of original newspapers, photographs and other documents is maintained by the Portsmouth Athenaeum.